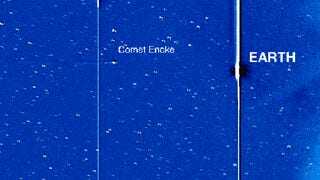 The H-1 camera on board NASA's STEREO-A spacecraft has captured this sequence of the two comets now en route to the Sun: Encke and ISON. They look like sperms trying to fertilize an egg named Earth—which is quite appropriate, given the hypothesis that comets brought life to this planet. Dark "clouds" coming from the right are more dense areas in the solar wind, causing ripples in Comet Encke's tail. Using comet tails as tracers can provide valuable data about solar wind conditions near the sun.